There is the Cantonese classic salt and pepper squid, and there is also the Mediterranean salt and pepper calamari. Both versions are hugely popular with diners all over the world. This version by Bill Granger from his book BIll's Basics is more to the Mediterranean style in taste and presentation. I hardly do deep frying, and I loathe a greasy kitchen. I was pleasantly surprised there was no splattering when deep frying the squid. The trick to keep the squid tender is to coat in light batter and cook it quickly at a very high temperature. The deep fried cut chilli adds a nice touch and taste to the squid. You can also cooked fish, prawns, mushrooms or vegetables in this method. I used Swiss brown mushrooms together with the squid. Mix together 120g of the cornflour and the soda water to make a batter. Season the remaining cornflour with the salt and pepper. Place a wok over medium high heat. Heat 5 cm oil in the wok until very hot. Serve immediately. This was gone fast! We enjoyed it very much, exactly like those in restaurants everywhere. 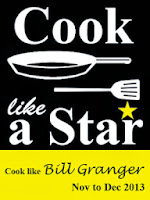 This will be my last post for November Cook Like A Star 'Bill Granger'. I will be away on holiday starting today, and will be back for a short break before more travels around Christmas and late January. This is thanksgiving season, and God is the reason for our Hearts to be filled with Thankfulness. I've never made salt and pepper squid because I don't like frying either ;) haha....I would have thought that squid would splatter like crazy when frying! :O Yours looks really good- just like the ones from restaurants ;) Did it take a lot of effort? I like to use this recipe to fry mushroom too... Yum! Hi Lian , I'm one of those who hates deep-frying as well but yesterday I've made a deep-fried chicken dish :P :D It's been sometime since I had some fried squid , years I guess , okay , not counting the one I bought in some hawker stall lol Love your crunchy squid and mushrooms , the chillis' a great addition . Just delicious ! i love the chinese style salt and pepper squid. Tho i dont know how does this taste differently, it looks great to me! happy holidays to you, Lian! We love squids a lot! And the plate would be clean in no time! Looks really delicious! Your salt and pepper squid looks so good! I also dislike deep frying, often I try to make an oven-baked version, wonder if it will work with squid though. Looks delicious!